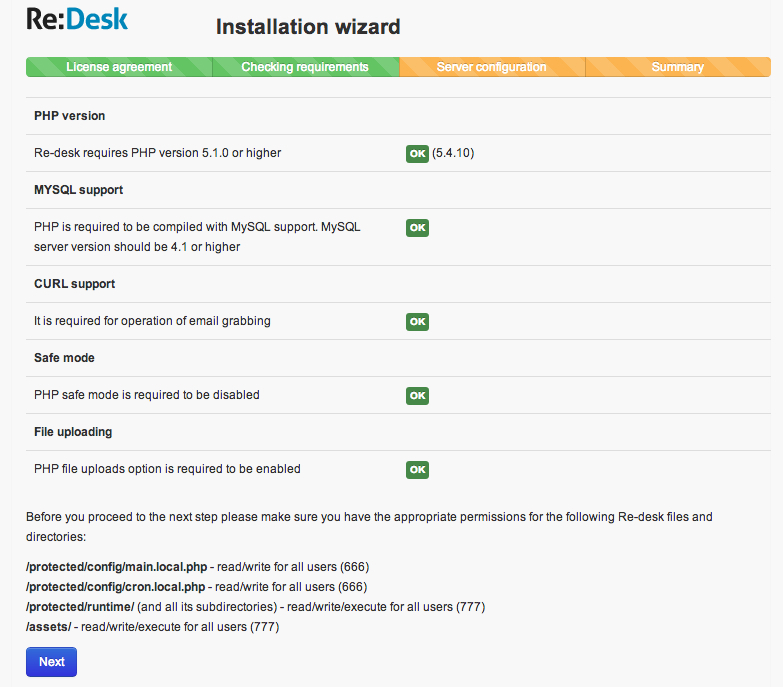 Re:desk has an installation wizard that helps you to install the software. The following instructions will guide you through the installation process. Usually, it takes 10-15 minutes to complete if your server is configured correctly. Firstly, download compressed package with the Re:Desk files from our site to your local computer. Now you need to place the files in a web accessible directory on your server or hosting account. This can be either the web root or any of its subdirectories like /redesk/. If you nest the files directly in the web root, the Re:Desk login page will have URL like http://www.example.com/index.php. Otherwise, the URL will contain the name of the subdirectory right after the domain name, for example, http://www.example.com/helpdesk/index.php. If there is only FTP access available, extract the archive on your local computer and then use your favorite FTP client to put the files from the package to the required directory on your web server. Make sure you retain the original file and directory structure. Check that your web server meets minimum system requirements. Ensure that you can access your web server via shell or FTP. Check that you know a License Number for Re:Desk. Be sure you are located in Re:Desk root folder before running these commands. Point your favorite web browser to run the installation script. 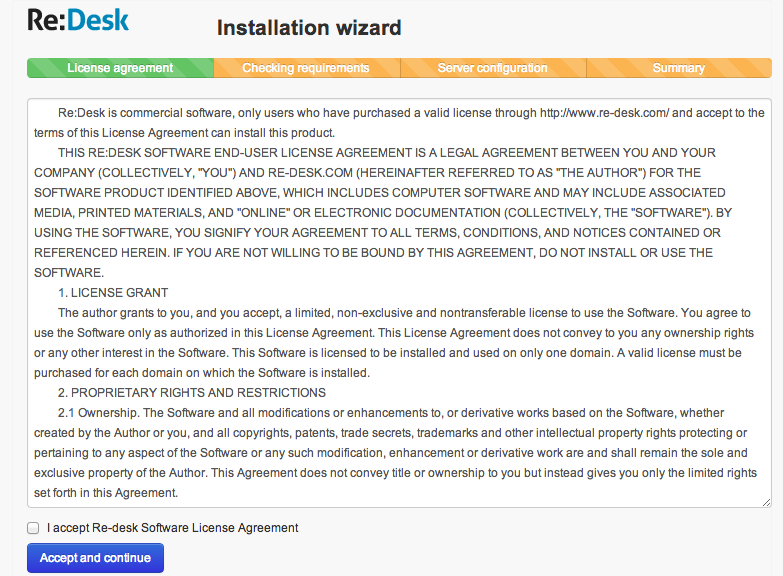 Please thoughtfully read the Re:desk License Agreement, and select the check box below the text of the Agreement to confirm that you agree with the conditions of the Agreement. If you do not agree with any part of the Agreement, stop the installation by closing the current page of the web browser. Warning: If you see "Not Found" error after clicking the button under the first installation step, please be sure your server configuration meets all the system requirements, especially "mode_rewrite" status. Contact your hosting administrator to enable all the settings for your server. 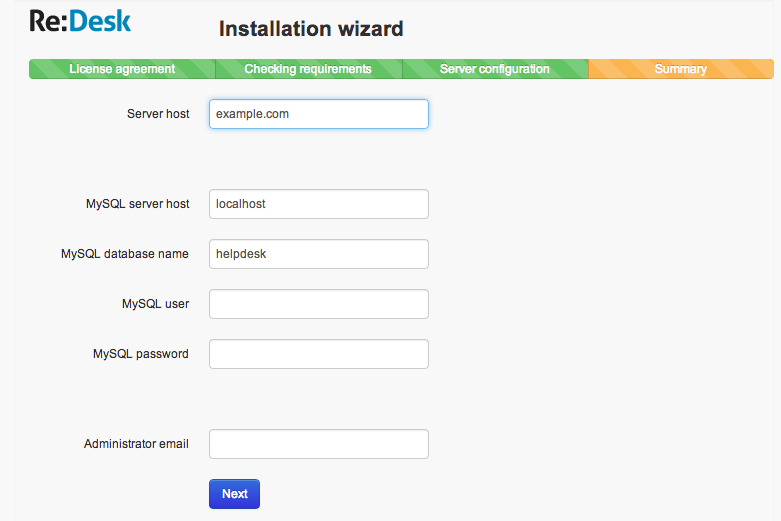 At this step, the Wizard checks that your web server meets the requirements to run Re:Desk. If some of the tested parameters are indicated as failed, you need to fix them before you can proceed to the next step of the Wizard and continue the installation. At this step, you need to provide the details of your web server host and MySQL server as well as specify your License Number (for Re:Desk paid version) and define other parameters. Server host name - DNS name of the server on which you are installing Re:Desk. MySQL server host - DNS name or the IP-address of your MySQL server. MySQL database name - name of your MySQL database. MySQL user - username for your MySQL user account. MySQL password - password for your MySQL user account. Administrator e-mail - email address of Re:Desk administrator in which you will receive email notifications. Re:desk will need your Company name and License number. And you should click "finish" button. The "chmod 644" command leaves the file readable and writeable for the file owner and makes it readable for all other system users. The file contents cannot be viewed in a browser though. One of the main feature of Re:Desk is an availability to fetch your emails and create tickets automatically. To get this opportunity you should configure your email settings at "Settings -> Email". 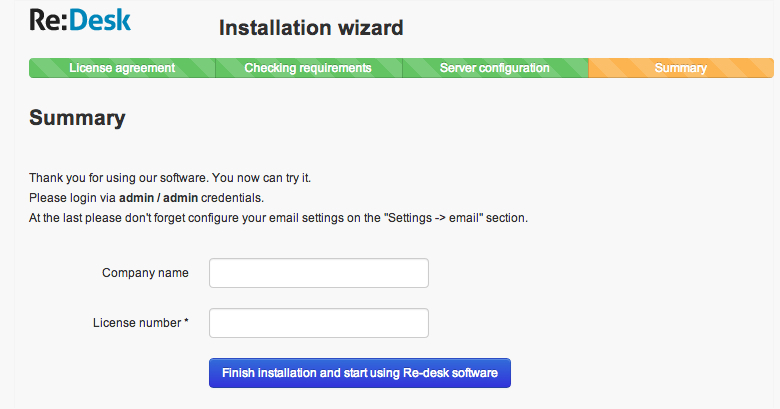 Re:Desk will automatically fetch new emails from specified email address and create new tickets with messages. We strongly recommend you using IMAP email protocol because it is better and faster than POP3 protocol. If your email server has IMAP protocol, Re:Desk will fetch only unread emails, it is the best way to organize customer support with using Re:Desk. If your email server has POP3 protocol, Re:Desk will fetch all your old email messages, so it is recommended to delete all emails of your mailbox which will be used as a customer support email address. This is the one big limitation of using POP3 protocol with Re:Desk.